Over the past week we have been reading the Gingerbread Man (I got a lift-the-flaps version from the library and it has been a big hit). We have done a few activities related to the book, which have been enjoyed. Firstly, we cooked gingerbread men. These took us ages, but they have been eaten and asked for, for over a week. They have kept really well. Unfortunately, I didn't get any photos of this as we were cooking. We made playdough and added ginger into it to create a sensory experience. I also gave R the gingerbread cookie cutters to use with the dough. I made a gingerbread shape matching game from Preschool Printables which R did easily and lost interest in very quickly. We made a gingerbread man with collage materials. I had intended this to be a follow-the-directions activity rather than a creative craft. We did finger painting and I added some cinnamon to it for a bit of variety. R loves anything to do with getting messy and painting, so this was a very popular activity. We made cookies from collage materials. Here we put buttons on the gingerbread man cutout. I said a colour and R had to find buttons of that colour, placing them on the gingerbread man. 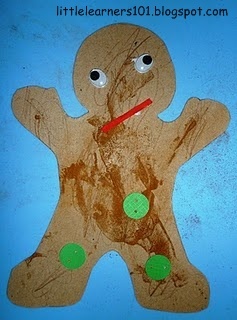 We made the gingerbread man puzzle from The Gingerbread Baby Lapbook over at Homeschool Creations﻿. Thank you for this great resource. R really surprised me with his ability to put this puzzle together, not having seen it completed before putting it together. Love the button color idea and adding the scent to the paint! :) Thanks for sharing! !